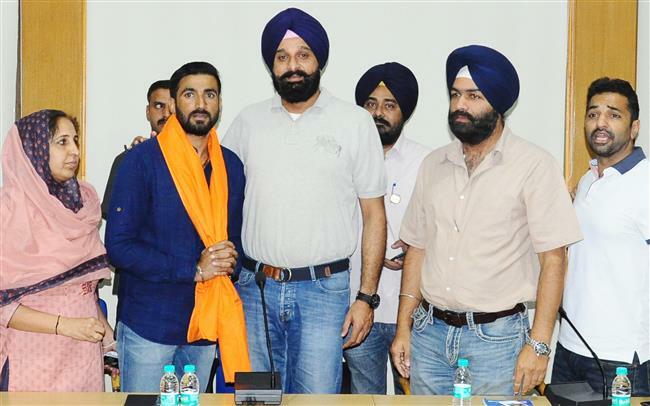 Chandigarh, Aug 13: Founder member of the student organization PPSO Captain Amarinder Singh today joined Shiromani Akali Dal(SAD) at its headquarters here in presence of former minister and youth Akali leader Bikram Singh Majithia in a simple but impressive ceremony. Describing Captain induction in the party as a big asset, Majithia conceded that students and youth which were weaned away by the Congress during the last assembly elections by the Congress on the promise of “ghar ghar rozgar”. “ However all were now totally frustrated and disillusioned and are flocking to the SAD fold in a big way. They have realized that the false hope was mere poll stunt to hoodwink the gullible youth of Punjab”, he added..
Captain had floated the non-political student body way back in 2015 and since then the PPSO has been contesting Punjab Students’ Union and cornered substantial number of votes with its performance improving each year. Thus, in a short span of time, the PPSO emerged as a force to reckon with in the students’ politics. Though no students’ union elections are held in Punjab yet Captain build up PPSO units and spread it across Punjab and has area of influence in Patiala ,Sangrur, Bathinda , Amritsar and Tarantarn districts. And surprisingly for the organizers, large numbers of students turned up overflowing the SAD complex.